It should be no surprise that the original LEYE restaurant is still alive and kicking and serving great food. I had not been back to RJ Grunts in a few years and Erica had never been before. It's a staple of the lincoln park neighborhood and a wonderful example of a winning formula for success in the restaurant industry - serve simple but delicious food in a fun setting with good service at good value. That's what you want from Grunts and that's what you get. 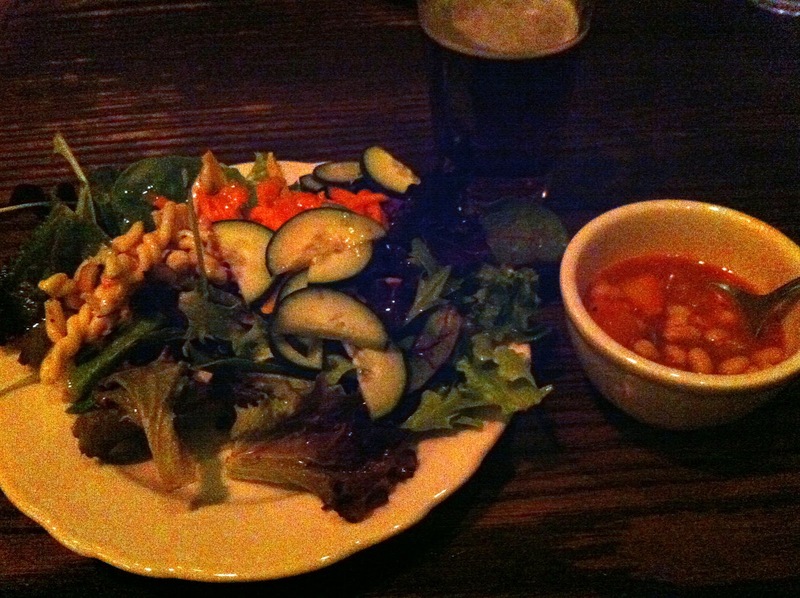 The place is small and charming, with a small wooden bar in the front and not a lot of tables/booths in the back. The large famous salad bar is front and center in dining area. Grunts' menu is simple American food with burgers, salad, wraps, wings, ribs and shakes. I was surprised/forgot how large the menu actually is given what is on it, but it's nice to have options for regulars or non-burger eaters. We were in hamburger mood so I went with the Yowza (peppercorn burger, spicy ketchup, pepper-jack, onions, lettuce, tomato, bacon) and Erica did her standard plain burger with lettuce and ketchup. Instead of a starter we both opted for the salad bar (only $6 with entree order) - one of the last few great salad bars I've been to in a while with plenty of options, soups, AND JELLO. My burger was good, though a little undercooked and unstable for my liking. 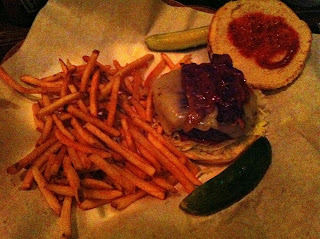 But the flavors were really nice with the peppercorn and spicy ketchup providing a nice kick. They are large burgers and served with fries - definitely worth the $11 asking price. Even if the trend in dining is grass fed, organic, whatever (e.g. DMK deliciousness), sometimes a old fashion ground/sirloin burger with good toppings is just as appreciated. 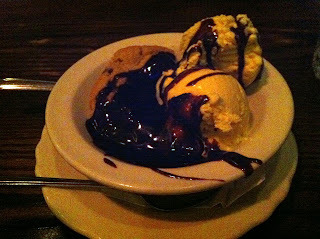 Lastly, what better way to end an all American meal than with a warm chocolate chip cookie smothered in ice cream and hot fudge?? (for only $3.5!) I know they have great shakes but this looked too good to pass up and it lived up to expectations.